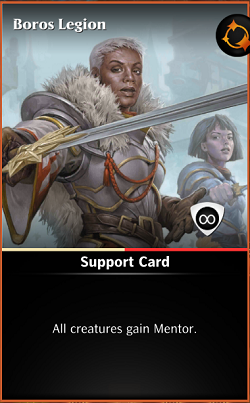 "The friction between the guilds of Ravnica has never been more palpable. An absent Guildpact has given rise to new guild leaders with unknown agendas. On this critical moment, each guild must gather informations and seek for possible allies. You must unlock the nodes by beating the previous one at least once. 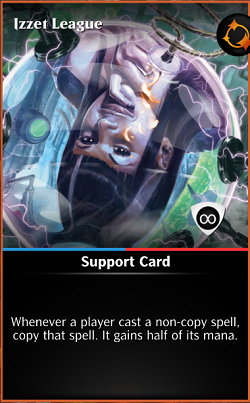 Your Planeswalkers will be attached to their current nodes, so you can play with any Planeswalker that shares at least one color with the node's colors. Boros Legion: All creatures gain Mentor. 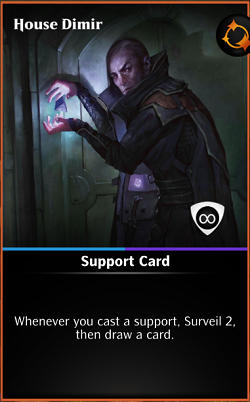 House Dimir: Whenever you cast a support, Surveil 2, then draw a card. Izzet League: Whenever a player cast a non-copy spell, copy that spell. It gains half of its mana. Golgari Swarm: Whenever a nontoken creature enters the battlefield, it gets +X/+X where X is the number of create cards in its controller's graveyard, up to 5. 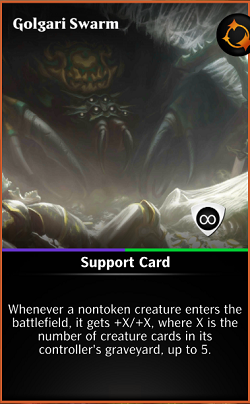 Selesnya Conclave: At the beginning of each player's turn, the cost of the first card in their hand is reduced by X until end of turn, where X is the number of creatures and creature reinforcements that player controls. 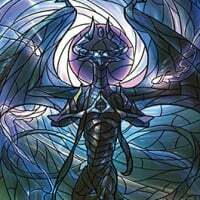 Cast 3 or more creatures with power 6 or more. 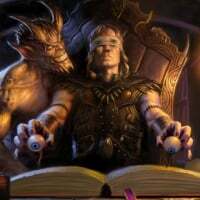 Cast 3 or more creatures with power 3 or less. Cast 4 or more supports with cost 8 or less. Win the fight within 10 rounds. Cast 5 Spells with cost 8 or less. Lose 3 or more creatures during a single fight. Cast 2 or more creatures with cost 15 or more. Create 6 or more Creature Tokens during a single fight. Will all 4 nodes have the same objectives on a given day? Can you comment on why we're required to play the guilds in order? The "Across" event sort of had the thematic element that we were traveling, but the guilds don't have that flavor. To be honest, I played "Across" extensively and having to play them in order basically meant that the event felt short. I rarely got to play the later events before I prize'd out and stopped playing. It would be great if the order either shuffled, or just let us play which ever node we wanted in whatever order we wanted. This also rewards/penalizes players unequally depending on what good Guild cards they randomly draw, and will hurt new players more than higher tier players. Unless there's reasoning that I'm not seeing? Pretty sure it's 1 guild/day, not 1 guild/node that you would have to progress through. You can't fit 5 guilds in 4 nodes if they did it that way. Or they did make it that way and one guild isn't represented each day but that seems to make very little sense. Why does Dimir have a win in 10 turns or less objective? They are by far the slowest guild in this set. They can, if the 5th guild of the day is the one that provides the Special Rules Indestructible Support. One guild will give the flavor, and you face the other 4 in the day's nodes. Yea Brigby clarified in that thread that one guild isn't represented in the nodes each day (Guild of the Day). So the nodes get their objectives from whatever guild they are, while the GotD puts it's own support in each match. I think the idea is that you play as one guild against the others? 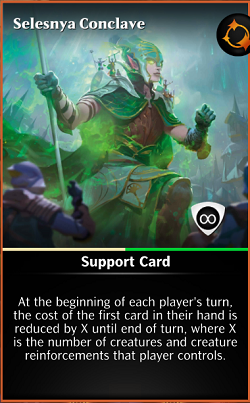 The odd part of this is you can't play with the cards from those guilds in some nodes without some creative planeswalker selections. I think it might be the reverse actually. You play as the other 4 guilds, and the remaining guild is defending against your attacks. That one guild's Support in each node represents the 4 guilds fighting on their turf. As mentioned in the release notes section: Really nicely done with this event! It will keep each node on each day interesting and encourage people to learn to build to shifting objectives. Just want to pitch in with another kudos on this event. I feel that the reward amount is right on the nail, the objectives are fun, the incentives to continue the nodes are solid and the event is overall exactly what it should be for a daily event. SO much better than AI. Keep it up!